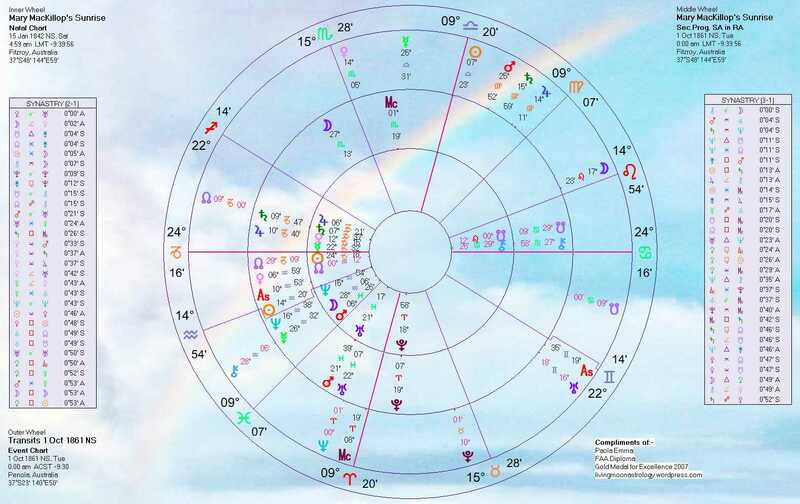 I have analyzed Mary’s Birth Chart in a previous posts, published in December 2009, The First Australian Saint. And again in January 2010 I considered some astrological highlights of her early years in a second post, Mary MacKillop’s Progressions and Transits between 1858 and 1866 (age 16 to 25). It is time now to explore astrologically some of the salient events of her career as a nun and teacher, and also to look at the Transits that will be active on Sunday, appointed day for her canonization in Rome. Mary MacKillop’s life has been a very eventful one. In order not to get lost in a maze of information, I have chosen some focal dates and looked at both Secondary Progressions and Transits mainly for those.Today I concentrate on 1861, the year Mary met father Julian Tenison Woods, the man who inspired her mission. 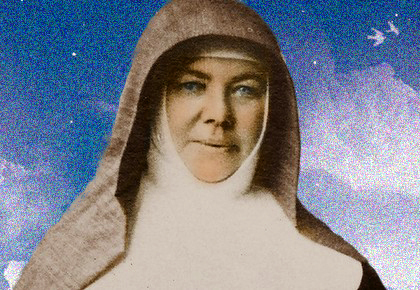 I have to remind my readers here that the Birth Chart of Mary MacKillop is a Sunrise Chart because her time of birth is unknown. The readings below, I hope, will show clearly how reliable and interesting these types of Charts can be. 1861: I was unable to find an exact date for their first meeting. Below here is a triple-wheel horoscope, with Progressions (middle wheel) and Transits (outer wheel) plotted around Mary’s Birth Chart (inner wheel). They are calculated for October 1 1861. I chose this date because both Transits and Progressions active then seem to link well with that fateful meeting. As you can see there were many planets that year transiting Mary’s Solar IX House, the Guru or God House as many call it, traditionally the area of philosophical and spiritual learning. Saturn in fact was already on the cusp of this House at the start of 1861 and transited there until October 1863, two years later. Jupiter entered the IX House together with the transiting Sun and Mars at the beginning of September (!). Mary was born with a conjunction Jupiter-Saturn in Capricorn and during that fateful year Jupiter and Saturn were again together, becoming conjunct on October 21 in the middle of this House representing the quest for meaning in anyone’s life. Mary was barely twenty, and that is as long as a synodical cycle (cyclical encounters) of Jupiter and Saturn lasts. All this is very significant indeed, the transiting conjunction in Earthy Virgo being also in harmonious aspect with Mary’s numerous planets in Capricorn (Saturn, Jupiter, Venus, Mercury and the Sun, all in the Twelfth House of spirituality and renunciation). Mars and the Sun transiting the same area as Jupiter and Saturn worked as activators for the two slower bodies. To add to this already meaningful situation the transiting North Node of the Moon became conjunct her Natal Jupiter-Saturn,between mid- September and mid-December. That year in fact the North Node transited her XII House and touched all her planets in it, including the Sun, being right on her Sunrise Ascendant and Sun in January 1861! This was another very significant transit, because the Nodes (North and South) form the so called axis of destiny, showing the direction fate is taking in a lifetime (North or Ascending Node, the one involved in the transits described) and the place from which that same destiny originated in the past (South or Descending Node). Often the Nodes also signify the person’ involvement with the world, his/her meeting with the collective, so they fit well this moment of Mary’s career when her earnest involvement with helping people began. And there is more: the Progressed Mars in Pisces was conjunct, for the whole of that year, to Mary’s Uranus, in the III House of basic learning and literacy (one of the Natal positions that shows her vocation as a teacher). This is another indicator that 1860/62 were years when Mary’s destiny took a sudden turn and when unexpected opportunities presented themselves, stimulating the more atypical side of her character and her reforming spirit (Uranus). Transiting Uranus, in the mean time, formed also an harmonious angle (trine = 120°) to Mary’s Natal Neptune, showing a right time to blend beautifully that same reforming spirit with her spiritual aspirations (Neptune). To end the reading for 1861 transiting Neptune, then just on the cusp of Aries (the pioneering sign), also formed an harmonious angle to her Natal Lunar Nodes, her axis of destiny, the ideal time, personally for Mary, and also collectively to dare to initiate something completely new in the areas of spirituality and religion. These are all amazing transits, very appropriate for the events that occurred at that time in her life. If interested In Mary’s Astrology, please follow my future posts on her life and times, to be published shortly.